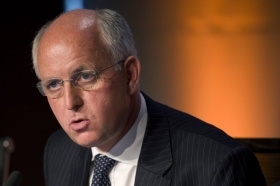 PSA Chairman Thierry Peugeot is open to forming new alliances. Fiat CEO Sergio Marchionne is not the only European auto executive with consolidation on his mind. Thierry Peugeot, who chairs the supervisory board at PSA/Peugeot-Citroen, said Tuesday his family is open to forming new alliances or partnerships, and is willing to dilute its shareholding in the French carmaker to make the right deal happen. Peugeot, who rarely speaks to the media, told interviewers from French business daily Les Echos that the family "is not at all opposed to considering a certain number of alliances or tie-ups." The Peugeot family, which controls 30 percent of PSA shares and about 45 percent of voting rights, would accept dilution of its holding, provided it remains the major shareholder, Peugeot said. Any future alliance or partnership would have to be in line with the family's objectives of guaranteeing the growth, profitability, and independence of the French carmaker, Peugeot said. The long-term goal is to boost PSA's global sales and give the French automaker a stronger worldwide footprint, Peugeot said. Peugeot's interview appeared one day before the French carmaker's annual shareholders meeting, which will mark the first public appearance of new CEO Thierry Varin, who assumed control over Europe's second-largest carmaker Monday. Varin, 56, was chosen by the Peugeot family to replace former CEO Christian Streiff, who was dismissed from his post in late-March. He is expected to use Wednesday's shareholder meeting to outline his overall strategy for PSA, which suffered losses of 343 million euros in 2008 and still faces major uncertainty in 2009. Company sources told Automotive News Europe that Varin also will likely lay out plans for diversifying PSA's sales away from its base in Europe. This is expected to include future alliances and partnerships. Under former CEO Streiff, PSA largely sat out the most recent round of consolidation discussions. So far this year, Fiat S.p.A.'s Marchionne has made a deal to get 20 percent of U.S. automaker Chrysler LLC and nearly got control of General Motors Europe's Opel and Vauxhall brands. There have been rumors that Marchionne also is interested in an alliance with PSA, which would create Europe's biggest automaker and boost Fiat well over the 5 million units of yearly output the CEO has said he wants. Marchionne has denied having interest in a new alliance with a French partner, while PSA, for its part, has downplayed rumors of a future tie-up with Fiat.